Our online card maker lets you show how much you care in a beautiful and meaningful way. Strengthen your connection with someone by sending a thoughtful card at a thoughtful time. Make an online greeting card for a special occasion or just to say hello. Our online card maker platform is super easy to use, and takes only a few minutes. From birthdays and holidays to get well and sympathy greeting cards, we have just the design for all of life’s moments. eCard maker from Smilebox creates precisely the online greeting card that you desire. If you are looking for something low key, find one of the quieter free greeting card designs, change the text, and share it with friends and family. But, if you are looking for an online greeting card that shouts out your message, Smilebox helps you there as well. We have loads of crazy designs that you will love to customize. No matter which free greeting card you choose, we make it easy for you to add your personal touch. Change colors, fonts, and text at will – every adaptation is shown immediately in the eCard maker. Want more details? Keep reading to discover how easy it is to use our online card maker. The online card maker divides our selection of eCards into various categories. Find the one you’re looking for and the exact design that tickles your fancy. Then click “Personalize”. You can search for the photo that’s the highlight of your online greeting card by clicking “Add More Photos”. The online card maker enables you to search across your social media accounts, phone, and computer. Say what you mean with text and color that you can change easily. For added style, pick a different font, and even add music from your tunes or ours. After making sure that the final draft of your online greeting card is ideal, you can share it in various ways. Email, social media post, and storing your online greeting card on your computer are all available options. You can also print your online greeting card and send it by mail. 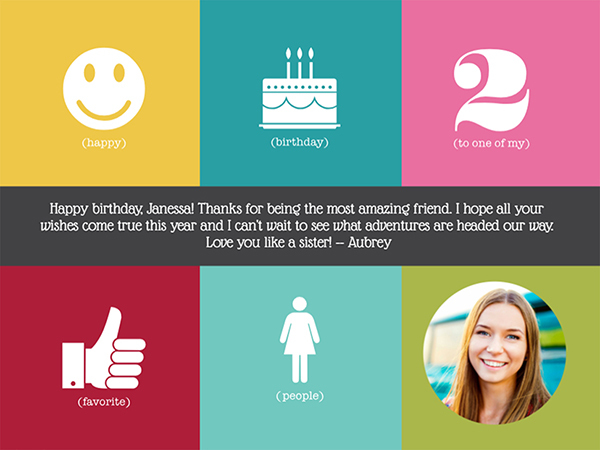 Smilebox card maker has templates for virtually every sentiment. Our online card maker provides designs for holidays, birthdays, anniversaries, and just to say “thinking of you”. The template serves as the starting point for you to express yourself in the online greeting card. The detailed personalization options of the card maker let you hone the template’s generic message into something personal. You can customize your online greeting card through the eCard maker’s personalization window. All of the controls to change color, font, and text are right on the page, as are options for music. The card maker also has a pane for uploading various photos for you to try in the online greeting card until you find the perfect one. Once you have finalized your online greeting card, you will have a creation to be proud of. What are you waiting for? Smilebox lets you show the world your talent with various sharing options that can reach friends and family, no matter what kind of device they use. Send your online greeting card by email, or put in on your social media pages. Online card maker also lets you save it on your computer (always recommended).